Please see the following link for grilling safety information. Its the season for picnics, cookouts and other outdoor parties. 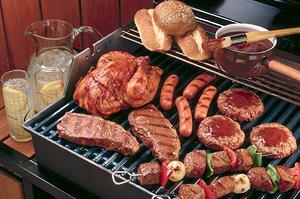 But eating outdoors in warm weather presents a food safety challenge. Bacteria in food multiply faster at temperatures between 40 and 140 degrees Fahrenheit, so summer heat makes the basics of food safety especially important. "Fortunately, there are a lot of steps consumers can take to keep family and friends from becoming ill," says Marjorie Davidson, Ph.D., education team leader in FDA's Center for Food Safety and Applied Nutrition. It seems basic, but not everyone does it. Wash hands well and often with soap and water for at least 20 seconds, especially after using the bathroom and before cooking or eating. If you're in a bathroom, use a water jug, some soap and paper towels. consider carrying moist disposable towelettes for cleaning your hands. Don't use a plate that previously held raw meat, poultry, or seafood for anything else unless the plate has first been washed in hot, soapy water. Keep utensils and surfaces clean. Marinate food in the refrigerator, not out on the counter. And if you want to use some of the marinade as a sauce on the cooked food, reserve a separate portion. Don't reuse marinade that contained raw meat. To kill any harmful bacteria that may be present, use a food thermometer. Hamburgers should be cooked to 160 degrees Fahrenheit. If a thermometer is not available, make sure hamburgers are brown all the way through, not pink. Chicken should be cooked to at least 165 degrees Fahrenheit. If you partially cook food in the microwave, oven or stove to reduce grilling time, do so immediately before the food goes on the hot grill. Refrigerate and freeze food promptly. It can be hard to remember while a party is going on, but food should not be left out of the cooler or off the grill for more than two hours. Never leave food out for more than one hour when the temperature is above 90 degrees Fahrenheit. Hot food should be kept at or above 140 degrees Fahrenheit. Hot food should be wrapped well and placed in an insulated container. If bringing hot take-out food such as friend chicken or barbecue to an outdoor party, eat it within 2 hours of purchase. In addition to bringing the grill and fuel for cooking to an outdoor location, remember to pack a food thermometer to check that your meat and poultry reach a safe internal temperature. When re-heating food at the outing, be sure it reaches 165 degrees Fahrenheit. Cold food should be held at or below 40 degrees Fahrenheit. Foods like chicken salad and desserts that are in individual serving dishes can be placed directly on ice or in a shallow container set in a deep pan filled with ice. Drain off water as ice melts and replace ice frequently.